Miðholt, our house was built in 2006, two cottages in 2008 and the third in 2014. Close by is the farm Kolviðarnes, a farm raising cattle, sheep and horses. We plan to build another two cottages in the near future, depending on the demand. We were not active on the market renting these cottages until in 2012, then there was a large demand for accommodation in the area and in 2014 we introduced our renting on Booking.com. We are now almost fully booked during the summer months, so we advice you to book early.. 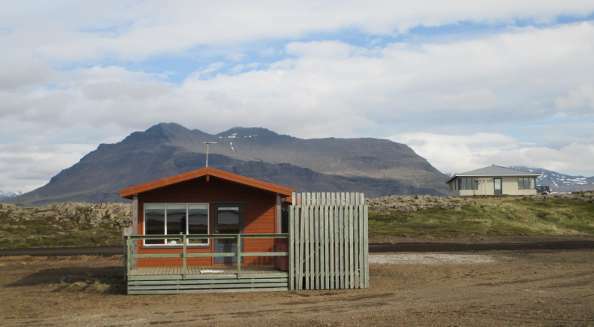 The area offers a great deal of interesting places for tourists, horseriding at Löngufjörur is very popular both for foreigners and Icelanders alike. The scenery is epic in Snæfellsnes, both summer and winter, and people travelling to the west fjords often stay here a few days on their way. The birdlife is very interesting, we often watch eagles flying in the area and then there are all types of seabirds on the beech. We hope that you will choose Fjaran when you travel to Snæfellsnes and we will do our utmost to make your stay enjoyable here.